MUADDIB: Studi Kependidikan dan Keislaman, with a registered number p-ISSN: 2088-3390, e-ISSN: 2540-8348 is a multidisciplinary scientific journal published by the Faculty of Islamic Studies, University of Muhammadiyah Ponorogo. It is at the national level that includes a lot of common issues or problems relating to sciences and Islamic Education. The purpose of the publication of this journal is to disseminate conceptual thoughts or ideas and research results that have been achieved in the field of Islamic Education and Islamic Studies. MUADDIB: Studi Kependidikan dan Keislaman, primarily focusing on the main issues in the development of educational sciences of Islam and Islamic studies. This includes the development of Islamic Religious Education, Islamic Education Management, Methods of Islamic Education, Islamic Education Model, Islamic Studies, and related topics. Please read this guide carefully. Authors who wish to submit their manuscripts to the editorial office MUADDIB: Studi Kependidikan dan Keislaman must comply with the guidelines of writing. If the manuscript submitted is not in accordance with the guidelines or written in a different format, it will be rejected by the author prior to further review. Authors will only accept manuscripts that meet the specified format. 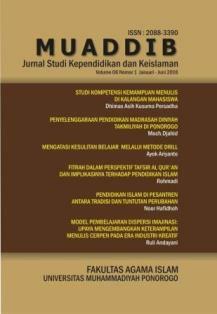 MUADDIB: Studi Kependidikan dan Keislaman will publish the journal twice a year: in June and December. Please send your manuscript. Please Download HERE Template.